All you’ve done through months and months of training is build a fitness vehicle. Race day is about how you drive that vehicle 140 miles across the finishline. The Ironman® course is littered with the bodies of very fit people who do not know how to race. We invite you to attend one of our Ironman® training camps this summer. More than “just another training camp,” we focus these weekends on teaching you not only how to race the Ironman® distance in general, but specifically how to properly execute every inch of the Ironman® course! Our Four Keys of Ironman® Execution DVD has been view by over 10,000 athletes. Our Ironman® training camps on the Lake Placid and Wisconsin courses have been attended by over 600 athletes since 2010 alone. 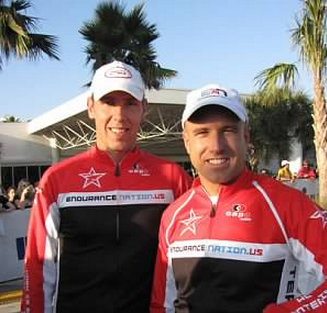 Endurance Nation has had over 1000 Ironman® finishers EVERY YEAR since 2010. In short, no other two coaches in the triathlon space have such a comprehensive data set of what works on race AND how to teach that to age group athletes like you. Lake Placid Training Camp, June 13-16, led by Coach Patrick McCrann. Patrick has raced Lake Placid 6 times with a PR of 9:56. He’s conducted nine camps on the course for over 350 athletes. Details and registration. Ironman® Wisconsin Training Camp, August 1-4, lead by Coach Rich Strauss. Rich has raced Wisconsin three times with a PR of 10:02. He’s conducted 9 training camps on the course, as attended the race every year since 2002, and has coached several hundred athletes to the event. Details and registration. Ironman® Lake Tahoe Training Camp, August 8-11, lead by Coach Rich. Details and registraion here. New for 2013! Coach Rich has extensive experience training and racing at altitude. Details and registration. A 20wk Ironman® training plan, a $399 value! Over five hours of classroom instruction — we teach you everything about how to race Ironman® and then drill that down to the course you are training on. Gearing, bike setup, nutrition, racing with power and pace, the sand in _that_ corner and the trick to approaching _this_ hill. SAG support on the course. A camp dinner, sponsor discounts and more! Join the more than 600 athletes who have attended our camps since 2010 specifically to learn how to race their Ironman. Get ready for your best race yet with our years of racing, coaching and on course experience. You simply won’t find a more comprehensive or affordable camp!